Get your course approved for ASHA Credit! If you want to offer ASHA CEUs for an upcoming course but are not ready (or there is insufficient time) to apply for ASHA Approved CE Provider status, conducting a cooperative offering with Oklahoma Speech-Language-Hearing Association (OSHA) is the way to go! 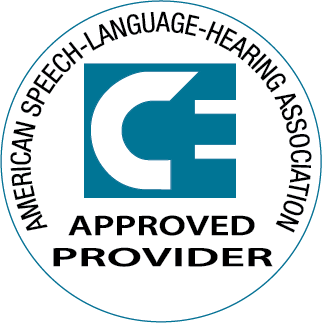 Oklahoma Speech-Language-Hearing Association is one of only three ASHA Approved CE Providers in the state. Do you need help getting your course or conference approved for ASHA CE Credit? Let us help you! Why Conduct a Cooperative CE Offering? Over 173,070 professionals each year look for the ASHA CE Provider Brand Block when seeking continuing education programs to meet their needs. The ASHA CE Provider Brand Block indicates that the program meets high standards and offers ASHA CEUs that are applicable toward licensure renewal, career advancement, and the ASHA Award for Continuing Education (ACE). Because your organization's course will be registered on the ASHA CE Registry, it will be listed on ASHA' s Web site through the ASHA CEFind, a searchable database that lists only CE courses that are being offered by ASHA Approved CE Providers. ASHA CEFind is updated frequently and provides individuals with access to the more than 33,000 course offerings registered annually with the ASHA CE Registry.